Comments Off on Summer Make-a-Tion 2015! Summer Make-a-Tion starts June 13th! 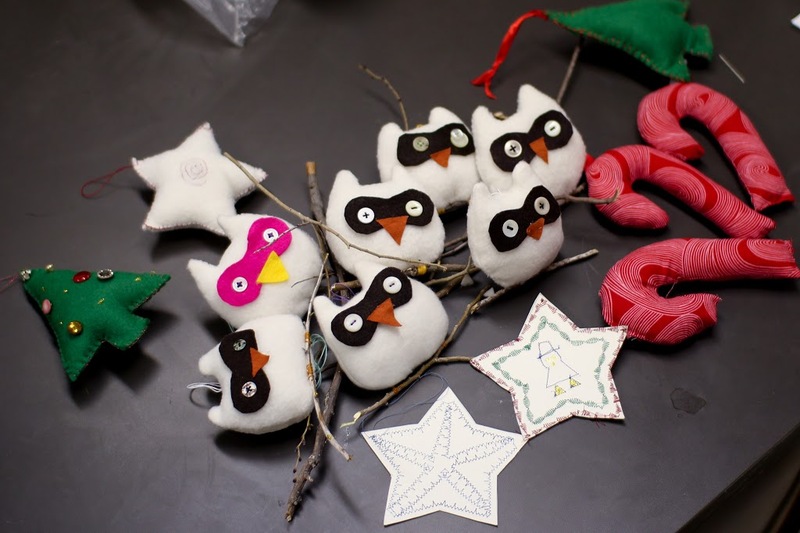 Make-a-tion is our summer long workshop series inviting everyone of all ages to learn, teach, tinker, collaborate, share, innovate, socialize, and create. This is the third year in a row we’ve run this event and it’s been a huge success. We are very excited about this years planned workshops. All our workshops are put on by volunteers and are open to the public. Pi Day Celebration This Saturday! Comments Off on Pi Day Celebration This Saturday! We will be holding a Pi Day Celebration this Saturday and we want to invite you all to attend! Come and celebrate this mathematical awesomeness! 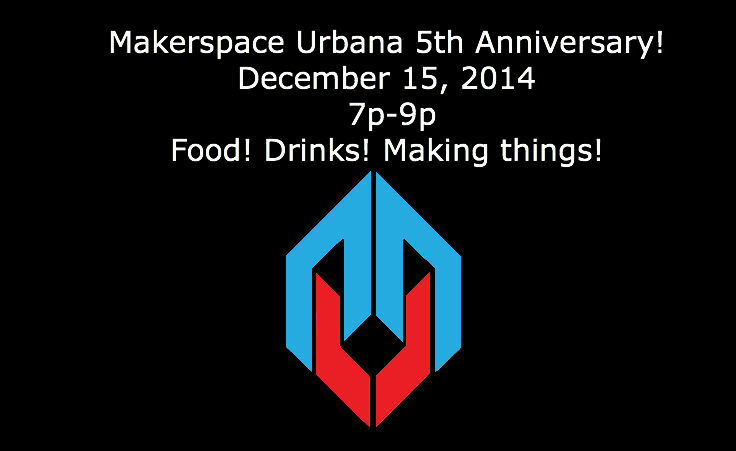 All proceeds from the event event will be donated directly to Makerspace Urbana so we can continue providing services to the community! Check out the full schedule and details at the event page. Comments Off on Happy Birthday, Makerspace Urbana! Join us for our fifth anniversary celebration! As a part of this momentous occasion, we’ll host special open hours where we will make things, eat, drink, and be merry. With this milestone, we want to celebrate the past by looking forward to the next five years of Makerspace! This anniversary marks the start of our capital campaign to support and grow the Makerspace into the future! We will share some of our history and discuss our plans for expanding and developing within the community. Most of all, this celebration is for you: the awesome people who make Makerspace THE place to be! Do you have a quadcopter? Well, bring it to this year’s event and give a spin through the massive obstacle course brought to you by River City Labs Makerspace in Peoria! 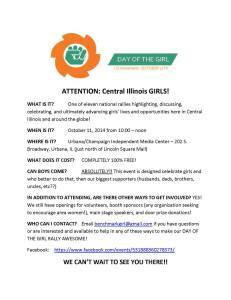 We’re super excited to participate in the first (hopefully annual) Central Illinois Day of the Girl Rally! 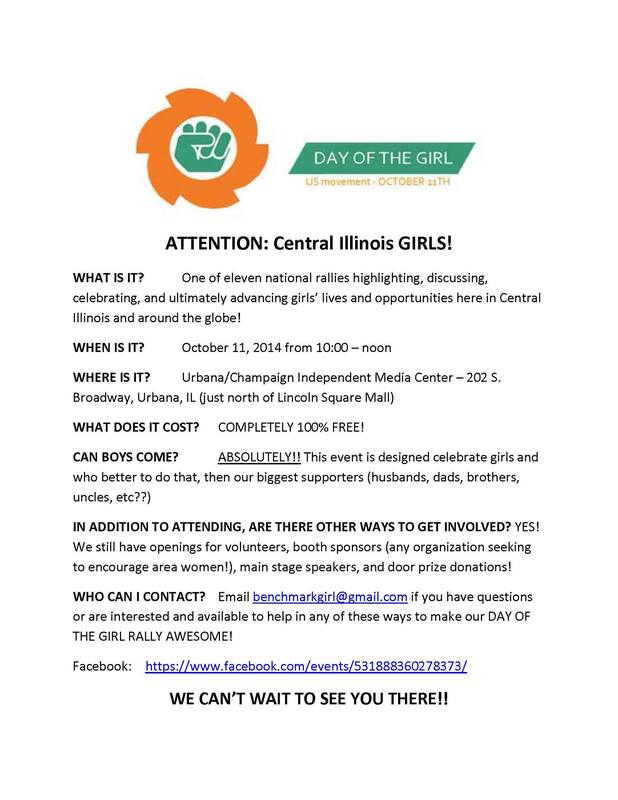 This event will be happening on Saturday, Oct. 11 from 10am to noon right at our homebase in the Independent Media Center (202 S. Broadway Ave in Urbana). You’re welcome to RSVP at the Facebook invite or simply show up. If you’re not familiar with Day of the Girl, it’s a movement started by the United Nations to raise awareness of gender inequality around the world. Our very own Colten Jackson’s awesomeness has now been exposed to the techie world at large! Colten’s side project of re-using old electronics and re-purposing them as musical instruments is a featured article on WIRED Design. Read all about it here. Stay tuned for information on Summer Make-a-Tion 2014 and the (newly named) Heartland Maker Fest. Make-a-Tion will start at the end of July and workshops will be held every other Saturday from 10-12 and 1-3. Heartland Maker Fest will be on Saturday, October 18 at the Lincoln Square Mall in Urbana.